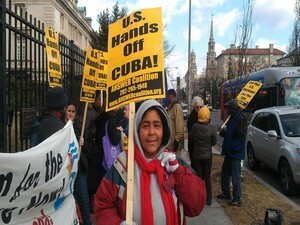 The rally took place outside the Cuban Interests Section in Washington, D.C. and was organized to defend the significance of February 24 in revolutionary Cuban history. On February 24, 1895, Cubans began an anti-colonial war of independence. This struggle, however, was cut short by U.S. intervention and the U.S. military occupied Cuba in the Spanish-American War. One hundred years later, on February 24, 1996, Cuba defended its sovereignty by shooting down two of three planes organized by violent Florida-based paramilitaries who frequently, intentionally and provocatively violate Cuban airspace – even dangerously dropping materials over cities. This justifiable defense was twisted by the Miami courts to falsely charge Gerardo Hernandez, one of the Cuban Five, and railroad him to a double-life plus 15 years prison term. Sunday’s rally demonstrated the power and strength of solidarity. Every year, reactionary anti-Cuban groups gather on February 24 to denounce the Cuban Revolution. This year, as voices defending the Cuban Revolution echoed up and down the street, those groups were markedly absent. The unification of such a broad range of groups and individuals in defense of Cuba itself was a reflection of the solidarity that Cuba has shown with working and oppressed peoples around the world. That is why we continue to demand in one voice: U.S. Hands off Cuba! Free the Cuban Five!